← Do You Believe In The Stars? 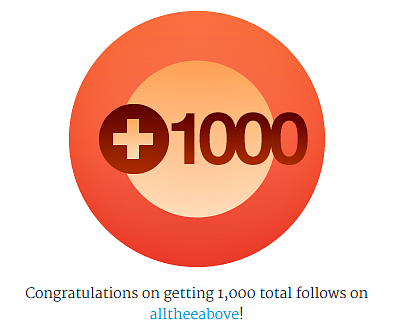 All Thee Above Has Now Reached 1000 Followers on WordPress! Thanks For Your Support! Antonio at ALL THE ABOVE, has reached 1000 followers! What an amazing achievement. Antonio is a great community blogger and when I first started my blog, he was always happy to share my work! It’s been a few years now and even though this number came almost a month late from the Halloween date, its still sweet like Pumpkin Pie my friends. May you continue to keep visiting All Thee Above and continue on your Blogging journey. Happy Holidays to all and to all a rocking time! You’re more than welcome Antonio!